This is one of “those” books. You know, the ones where the very first recipe in the book tells you that the rest of the pages will be wonderful. The recipe in question here is Chicken Stock. 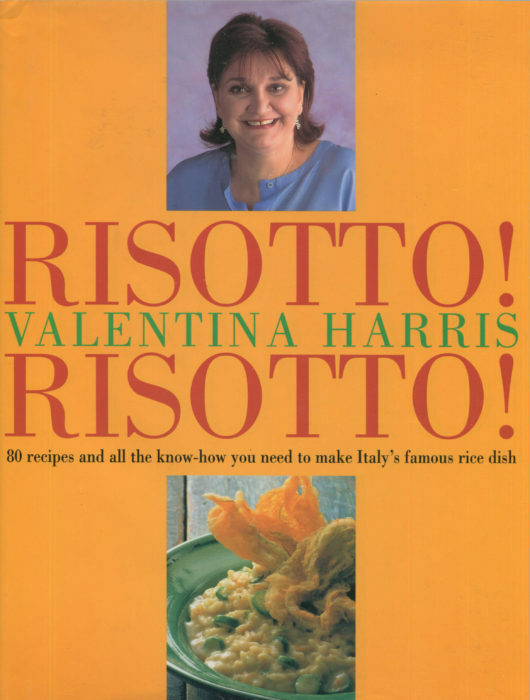 Author Valentina Harris has already explained that great stock is essential to risotto perfection. So her chicken stock is 1 onion, 2 celery stalks, 2 carrots, salt and pepper, a mere 2 ½ pints of water and, yes, 1 entire chicken. Cooked or uncooked. Just put the whole chicken into the pot, cook for a few hours, and treat the golden stock liquid as if it were gold. It actually is. Risotto! Risotto! is the perfect TBT story. It was published twenty years ago, and Valentina Harris has maintained a steady flow of cookbooks on Italian cuisine. She is the recognized British expert on Italian food and her fame should spread to this country as well. The book rings with expertise and authority as that Chicken Stock exemplifies. We have entered the cold months of winter and hearty comfort food is what we all need. Risotto, made with treasured expertise, is what we need. This book begins with the stories of rice and risotto. Rice is an Asian crop that only arrived in Northern Italy, thanks to the Arabs, sometime after the year 1000. It’s not clear if rice traveled down through the rest of Italy from Lombardy or was transported across the water from Spain and Sicily. Much of rice history is lost to us, but two facts are important. First, rice was considered food for the poor, although it grew on land owned by the rich. Second, rice was often considered a dangerous food for up north, unlike in the south, rice is grown on flooded fields. That expanse of water was blamed for diseases like malaria and rice was considered a dangerous crop. For example, in 1575, if you grew rice in a wet field within 6 miles of Milan, you could be punished by three years in chains rowing a warship. At some point, in the 19th century, contemporary risotto was first crafted in Italy. Somewhere by someone unknown. Now, it is everywhere. And everywhere it is relished and even demanded. Ah, that Apple one is on our weekend menu. I’ll post a picture and the recipe. That leaves the 79 other recipes in this lovely book to explore some other time. Some other time soon. You may want to explore, too. 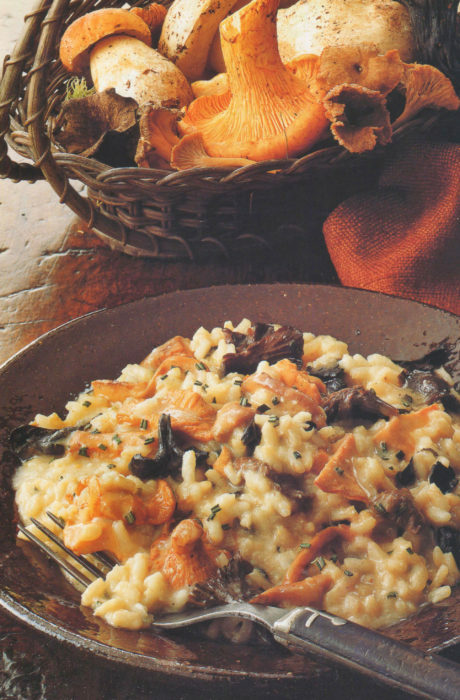 Risotto is Italian but it is also a food of the world to be enjoyed by us all. One golden batch of stock and rice at a time.